Wikipedia describes Business intelligence (BI) as "a set of techniques and tools for the acquisition and transformation of raw data into meaningful and useful information for business analysis purposes". In general, BI technologies provide historical, current and predictive views of business operations. Common functions of business intelligence technologies are reporting, online analytical processing, analytics, data mining, process mining, complex event processing, business performance management, bench-marking, text mining, predictive analytics and prescriptive analytics. When I refer to BI, I assume presenting essential information about the functionality of a business in a short and flexible way. The goal is to give management personal possibility to see what is happening, not in terms of concrete numbers, but in terms of relations, trends, comparable information. Popular BI platforms does not provide out of the box analysis for your business, they provide you will tools to implement such functionality. Quite often conception is based on fact that business analysts does not have sufficient knowledge in software development. Such BI solutions provide possibility to create reports and dashboards using limited amount of programming technologies, such as tools based on SQL queries. Their target usually is to cover needs of corporate business and price for this software is usually very high. Such solutions require additional human resources, investigation of time and money in order to integrate the data and implement the reports and dashboards. Normally, company will require its own BI department for such development. It could be bad investment for small and middle size business, such as online stores. Modern BI architecture supports huge amounts of data, but in most of cases it is unnecessary for e-commerce. Online store, even if it receives one thousand orders per day, in 3 years will generate data of only 1 million of orders. Such data does not need Big Data solutions. In addition, businesses, based on the platform like Magento, may have more or less common workflow, same data structure. 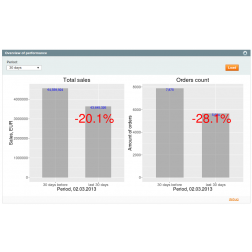 It is redundant to develop its own BI analytics by each online store. Most of data analysis, implemented for one store may be applied for another stores. It may be not true for predictive analytics, where concrete business model and type of product should be taken into consideration, but for descriptive analytics, common data analysis logic will work in 95% of cases. Solution we are working on is targeting business that wants to extract information from their data without involving a lot of resources into BI development. We offer out of the box analytics for Magento store that could be improved and customized by customer's request. It could be used as powerful framework for creating data analysis. Also, all data will stay on you servers, so it is essential plus for your data privacy. Our solution is based on Magento framework and R language, programming language for statistical analysis. By combining Magento with R, we have created framework that can be used by developers with knowledge of R and PHP. Creation of dashboards and widgets in BIM is flexible and fast. This solution also allows to perform data analysis in optimal was, so that all Magento data can be processed efficiently with no need to setup additional hardware. This solution will not allow to perform big data analytics of hundreds of gigabytes, but it will handle more data then existing statistical extensions for Magento store. It will allow efficiently perform analysis of data, not bigger then the size of your server's RAM memory. What about advanced analytics? Such analytics might be very cool, especially it excites people, who is working on it, who develop statistical models. But the live is so, that business first of all is interesting in data analysis that it can understand. In 90% of cases they want simple and clear data analysis. You will not find advanced analytics within the core modules of BIM extension. For advanced analytics business might need customization and it could be implemented based on existing framework, implemented within the BIM extension for Magento.